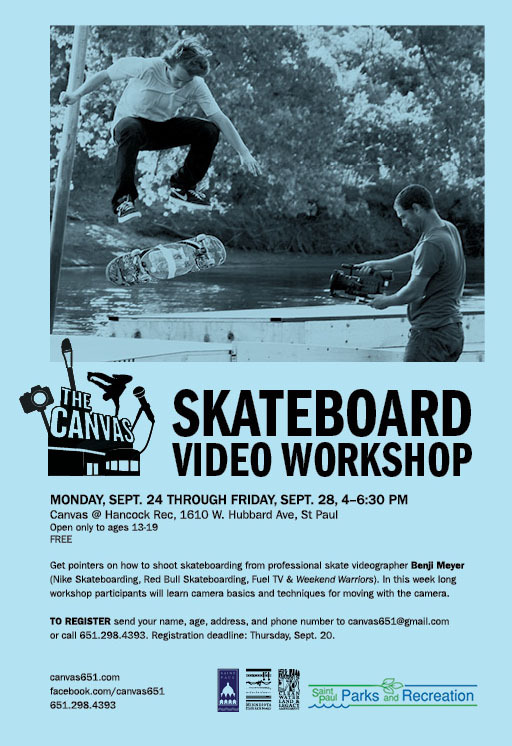 Benji is teaching a skate video workshop through the St. Paul Parks and Rec. department. It's for ages 13-19, if any of you in that age range actually read this site, and should be pretty cool. I mean, look at that flyer; you can't tell, but he's standing in a canoe. Sign-up info is above. Have you been to the new Send Help site yet? Why not? On the parallels between skateboarding and writing. It's all a matter of shutting off the mind, to an extent. If you've got some time today, take in this piece by Salman Rushdie about living under a fatwa. It kept me up late last night.